M. Eates, Paul Nash, Paintings, Drawings and Illustrations, London, 1948, p. 76, pl. 18. A. Bertram, Paul Nash, London, 1955, p. 136. London, Redfern Gallery, Watercolours by Paul Nash, 1942, no. 5. Leeds, Temple Newsam House, Paintings and Drawings by Paul Nash and Sculpture and Design by Barbara Hepworth, 1942, no. 32. Cheltenham, Art Gallery, Paintings Drawings and Designs by Paul Nash, 1945, no. 35. London, Tate Gallery, Paul Nash Memorial Exhibition, 1948, no. 91. 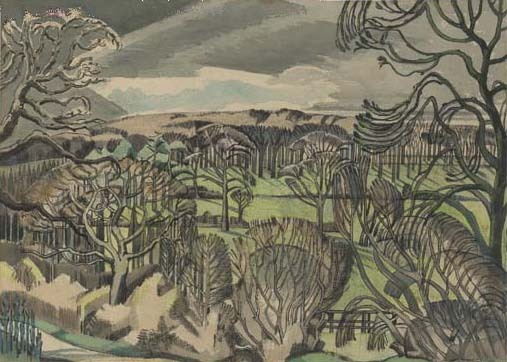 Ottowa, British Council, Paul Nash (Memorial) Exhibition, 1949-50, no. 91; this exhibition travelled to Toronto, Sackville, St. John, Montreal, Winnipeg, Vancouver and London, Ontario. Fulmer in Buckinghamshire is situated not far from Chalfont St Peter, where Nash moved his studio in 1918. John and Christine Nash, newly married had settled there and helped Paul and Margaret find a room in the village. However, they were forced to leave shortly after the end of the First World War, probably because Nash's life had been threatened by the husband of a woman whom Nash had either propositioned or seduced.